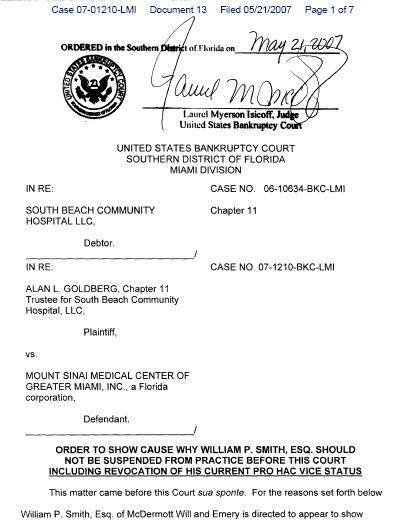 "Legal tabloid" Above the Law reports today on an unfortunate comment made to a federal bankruptcy judge by a partner in a Chicago law firm. 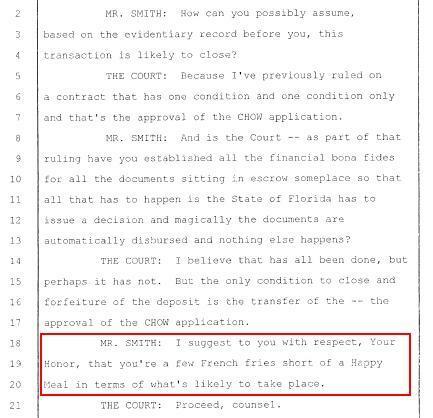 The issue seems to have been a disagreement over whether a particular transaction was likely to close — the judge thought it would and Mr. Smith strongly believed it would not. Finally, evidently frustrated, he told the court, "I suggest to you with respect, Your Honor, that you’re a few French fries short of a Happy Meal in terms of what’s likely to take place." The delivery of this insult "with respect" does not seem to have helped, since Judge Isicoff responded with a frosty "Proceed, counsel,’ and later that day with an even frostier Order to Show Cause, with transcript attached, and a copy sent to all court personnel. Likely to result in a supersized apology, probably.